For my son and me, promises were in the making. Someone on a Jacksonville radio station had predicted a sky-blue, eye-blue day over Southeastern Georgia. That was one promise. Within such a pledge lay chances of a beautiful day - one of the kind that puffy-white and cottonlike shrouds would hang lazily low over "the Okefenokee Swamp." In great expectation we would swim and breathe as surface-fish beneath clouds such as those. Small clouds would provide temporary relief from the Earth's furnace; but only for the time needed that a gentle wind might blow them away. We would not be exposed continuously to the full power of solar energy. Willingly, we four meandering humans would sweat, burn, and suffer the bites of pesty yellowflies and mosquitos. We would endure discomfort for sake of adventure. It was on such a day during summer of 1952 that my son and I were to meet our guides at Tommy Roddenberry's boatlanding. That Mr. Tom and Aaron Huey Chesser would awaken, arise, and be on time was another promise. My son and I would have suffered disappointment, if for some reason, our guides failed to appear. All day long, four humans were to make promises and play games of chance, as if in a hand of cards we had drawn. So fortunate as to have become acquainted with Mr. Thomas Chesser and his son, Aron Huey, we felt comfortable in trusting them as our guides and scouts. Had our guides overslept? Had something come-up that they our guides could not honor their promise? 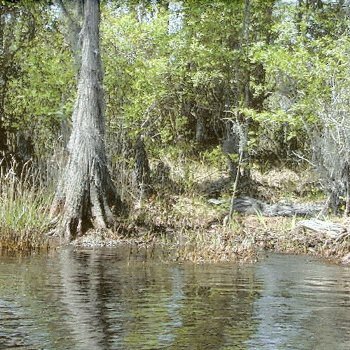 The day had been chosen for a fishing and sightseeing expedition into an area far within the interior of "The Great Okefenokee Swamp" known as "Chase Prairie." We'd first navigate twelve miles west along "the Swanee Canal" by boat. There the Swanee Canal would end. I remember that journey well. One image most clear fifty years later is that swamp shrubs hanged from each side of the canal, and those protruding limbs, many cottonmouths were using them as sunning-spots. Eventually, we were a long way from our Camp Cornelia home. Mr. Tom would fold his arms and shutter when he sighted those snakes. (The snakes hardly noticed when we passed them by. )At twelve miles west along that channel, we'd locate an alligator-trail and turn our boats Northward onto it.Five miles more and we'd come near a remote swamp island. Somewhere into that abyss we'd find "Floyd's Island" and fish in a small lake less than one-hundred yards from the shores of that haven. Our destination lay fifteen miles into the swamp's interior. Then we'd make our way that same distance back to Roddenberry's boatlanding. A fact of nature we learned there on the wildlife refuges is that some those creatures don't have the best of senses. Especially pertinent are their limited senses of hearing,sight, and intellect. Only a small brain is needed there for them to survive. Few reptile behaviors are on based anything premediated. They're wild creatures, and they're equipped to defend themselves and their young. Most behave instinctively. That's important for their survival. Birds and reptiles, such as alligators, run especially low on intelligence. Alligators are unpredictable, and one needs to exercise caution when encountering them. Several other mammals are exceptions. For example, bear are able to plan for their hunting and survival. Able to stalk their prey, they're also inquisitive. The same might be concluded with foxes, panthers, raccoons, and common mammals. Predicting how they'll behave during certain situtations is not difficult. If one steps-on or comes near the cottonmouth, it will bite. If they feel cornered or threatened, the bear might attack to defend itself. One must be careful. It's the same with alligators. As George and I were on time, we waited upon the arrival of our guides. And soon, there they were. We spotted Mr. Tom and son Huey in the distance. They bounced up and down on the box seats of a pickup that had been used on rough roads. Worn shocks, loose springs, and rattles resulted from the pickup's use on the sandy roads that had washed-out places. A blue, Chevy Pickup- a 1951 model is a vehicle one remembers years later. Pulling-up right beside us, Mr. Tom explained, "We had to feed and water the livestock, and Iva had to fix our grub. We'll be on our way now. I've listened to the radio. It's supposed to be a perfect day. Let's go fishing." Huey and George, our sons, were both good kids; as far as we knew. George was a fifth grader, and Huey was in grade six. We were into the summer of 1952. Huey was just a year older than my son; but more mature from the farmwork and chores he'd learned to perform. When George and Huey were with us, they were quiet and easy-going kids. Life held promise for both of them. Mr. Tom and I wanted things to turn-out right for our children. We'd lived through two wars and "the Great American Depression." If the word "depression" means being poor and needing cash, seldom had there been a time when I wasn't depressed. I planned my way out of farm labor by gaining employment as a refuge aid with "The U.S. Department Of The Interior." I didn't have to stand guard in the shotgun tower of a prison anymore, and my children didn't have to take a river ferry to get to school. They didn't have to walk to school either. Get the gun. Have some fun. Certain risks are involved upon entry into remote areas, and a "Journey To Chase Prairie" was no exception. Most important for ones security is finding experienced guides. George and I just happened to live five miles away from two of the best. Acquainted with the right people, that guided tour and fishing trip were by invitation. From our home at Camp Cornelia, the Chessers lived five miles to our Southwest on an island that bore their surname. Mr. Tom had been heir to Chesser Island and its home. Few people in the area were as experienced as were they. The Chessers had farmed, hunted, and fished the Okefenokee for three generations. If not the best, Mr. Tom and Huey were among the elite as guides. George and I felt secure with them. 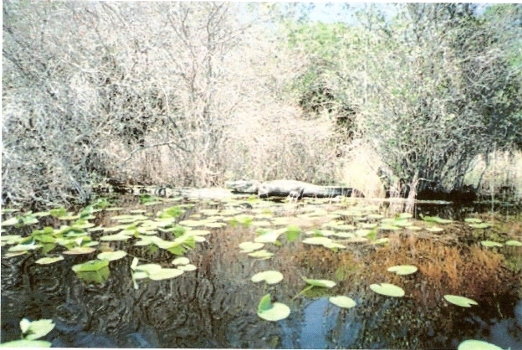 Image taken from http://strata.geol.sc.edu/Okefenokee-Swamp/images. This digital image was taken near the Swanee Canal not far from Camp Cornelia. Prior to our journey to Chase Prairie, Mr. Tom had offered George and me a preview of some of the precautions necessary for avoiding risks while living and working within the swamp environment. Traveling with George and me to Monkey Lake, it was just five miles from Tommy Roddenberry's boatlanding. Mr. Tom, George, and I went fishing there. We were having a wonderful time. The fun was not intended to last. At some time during that morning during the month of April, Mr. Tom pointed toward the distant Southwest, loudly and excitedly exclaiming, "Look, Mr. Rummy- there's a thunderhead over there! It's headed our way! There's a twister in it! I can see it there, can't you? It's a killer! Let's get out of here as fast as we can! Getting back to the boatdock from thirty minutes out was a terrifying ordeal. Sitting at the boat's stern was Mr. Tom Chesser. We were bombarded by hail, torrential rain, and high wind velocity. George and I bailed water from our boat. W We made it back to Roddenberry's landing in thirty minutes, but it seemed like an hour. Having poor visibility during that continuous downpour, Mr. Chesser must surely have had the assistance of "His Maker" as we made our way safely back to Roddenberry's boatdock and concession stand where Tommy sat dry as a bone and grinning. Thoroughly drenched, frightened, and exhausted, the three of us were not in the least happy. To top that, the proprieter, Mr. Roddenberry, behaved as if our misfortune brought him great joy. There before him stood three fisherman who were soaking wet. We must have been a sight reminding him of three wet and angry turkeys. Fortunately, the lightning and the twister missed us.
" Mr. Rummy! " proclaimed Mr. Tom, " I've heard the weather on the radio. It's supposed to be clear all day. Let's load up now and get started. We'll get there by 10:30 with good luck. It's not easy, but I know how to get there and back. The fishing is good there." Backing two boats out of a U.S. Government shed, one watercraft was a twelve- feeter powered by a five horse powered Evinrude outboard. Trailing behind and secured to stern by rope was a tiny push and paddle boat not more than eight feet in length. Food, water, and extra gasoline were stored on the largest boat. Included were a set of long pushpoles. They'd be needed to propel, by manpower, our canoe-like pushboat when we reached swamp areas where water became too shallow for using an outboard motor. For much of our fishing trip, we'd share a very cramped space; four of us on that tiny boat. Our motorized boat would have to be anchored and abandoned two miles from Floyd's Island. Two small oars were also taken along. Tommy Roddenberry, the attendant at the boatdock might have thought to himself, "You may get yourself into a situation you can't get out of. I can't come that far to get you. You'd be better to stay here close. I'd like it better here if you'd leave Fulks and his son on Floyd's Island there." "George!" said Huey to my son, "This will be a lot of fun for you, but it's a long way. I've been fishing in Chase Prairie twice before. We'll be traveling fifteen miles one way, and we'll be fishing within fifty yards of Floyd's Island. We don't love the snakes and alligators. Dad and me are both afraid of them. We have to watch for them and respect them by keeping our distance. "George, alligators don't have a bit of sense. I don't trust anything that has no sense at all." Rummage Ira Fulks At "Okefenokee National Wildlife Refuge"
Shown herin is Rummage Ira Fulks about 1960. 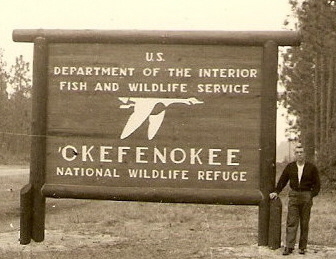 Known as R.I., I was employed as a refuge aid from July 1944 through February 1962; first at Kentucky Woodlands, next at Piedmont, and then at "Okefenokee National Wildlife Refuge." Forced to retire in 1962, I suffered a heart attack (angina). Retired for reason diability, Ella Belle and I returned to my home state (Kentucky). After moving back to Kentucky, I worked as a cabinet- maker and in home construction. Located four miles west of this sign is Camp Cornelia,where the Fulks' lived home from 1951- 61. At the headquarters for Okefenokee National Wildlife Refuge, this writer was employed as a refuge aid. Other employees were: Bill Pafford, Brantley Gay, Thomas Chesser and Jewett Hall. (Jewett lived and worked on the West Side at Fargo. 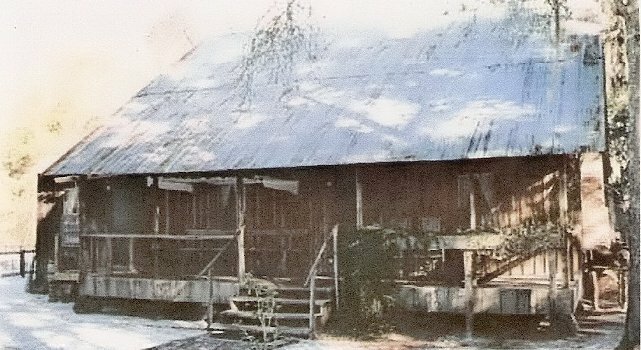 When needed Jewett was called to Camp Cornelia on the swamp's east side) All other employees lived and worked on the East Side;twelve miles from the city of Folkston, Georgia. While I, the author, was employed there, the management changed from Bill Edwards, Roy Moore, Gerald Baker and Joe Morton. None of the managers resided at the camp, but traveled from Waycross- a town forty or more miles north of the refuge. During the Fulks time at Camp Cornelia, Gene Siepert was also employed as biologist. Kristal Vanessa Fulks,Jennifer Gail Fulks, and Tracy Denise Fulks are Grandchildren of Rummage Ira and Ella Belle Abbott Fulks. The three are the daughters of George Harold Fulks. 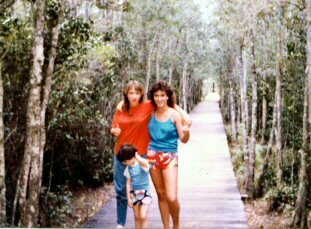 Photo taken on boardwalk near Chesser Island during summer of 1986. We used the five mile wooden walkway and climbed an observation tower. Seagrove Lake was visible about one mile in the distance from that observation post. After an hour or so, our party reached a reference point that I've come to image as twelve miles west. That was the virtual end of the Swanee Canal and the place to turn Northwards onto an alligator trail. We found ourselves staring into the face of a paintfaded sign that read:ENTRY BEYOND THIS AREA PROHIBITEDThe way was blocked by fallen timber. Our view into that "beyond" appeared forbidding. We were peering into a jungle into which the only known trails were made by reptiles and animals. Mr. Tom had stopped the motor's engine. He had removed his strawhat and begun to wipe sweat from his brow. "Mr. Rummy," Tom Chesser said, "Don't ever try to reach Billy's Island, Billy's Lake, or Fargo through that way. It's extremely treacherous. It can be done, but there's no way in the world I'd attempt it. A long time ago six men tried it in two pushboats. Two of them came out alive. We don't know what happened to the others. We don't know what's between here and Fargo, but we think there's wild people living between here and there." Soon we were off once more. Turning our boats Northward onto a wide alligator trail, we had five more miles to go. The first three miles went easily, but not without intrigue. That trail was three feet deep for the first three of those miles. We did encounter allligators. The first one was headed toward our bow and what would have been head-on.But something happened to prevent a possible disaster for our fishing party. We were faced with a chance that 'gator might take offensive at meeting our boats. And soon we heard: "Look out!Here it comes! "That was Mr. Tom yelling. Spotting our boats as it came in on a collision course, at three feet away from our bow, that first alligator submerged. Flicking its tail as it dived, we were wettened-down; water splashed onto our faces. "That was a close-call!" exclaimed Mr. Chesser. "That was a big 'gator there.They have the right equipment to break our boat into pieces. It's happened to people here a few times. I just hope it doesn't happen to us. We're a long way out." "When you see one coming that way, I think you might try pulling off the alligator trail and shutting-off the motor." I said to Mr. Tom. We met aliigators head-on two more times. Mr. Tom heeded my advice. Each time, we'd use pushpoles to align the boats back onto the alligator trail. Mr. Chesser would restart the Evinrude, and we'd continue Northward along that trail at half throttle. The alligators seemed to be happy that way as an engineer on a railroad locomotive might be, and so were George, Huey, Mr. Tom, and me. Our progress continued for a time until water became so shallow that the boats began dragging bottom. Two and one-half feet depth was required, and the outboard motor began stalling. It couldn't be restarted as the motor's propeller and shaft were dragging bottom. It was during that time that Mr. Tom stopped and announced: "I don't like to do this now, but we'll have to anchor this boat, load what we need onto the little one, and we'll have to push and paddle our way the last two miles. You can see that tallest cypress there to the West. We'll turn-off the trail here and head toward Floyd's Island. It's about two miles away. I can see a cypress tree in the distance. It's right on the edge of the island and very near our fishing spot. That tree used to have an eagle's nest in the top of it. It's less than a hundred yards from our fishing hole." Loading all that was needed onto the push or paddle boat, Mr. Tom and I began using the eight-feet long pushpoles to move the boat towards the cypress tree two miles in the distance. Our motorized boat disappeared from view after a time, and I was silently concerned that we might not be able to find our motorized boat that we had abandoned on the trail. We would need it to return to the boatlanding before darkness set-in. I didn't relish that thought of having to push and paddle fifteen miles or more. Would the alligators destroy it or might it be blown away? Did we make a wise decision by coming on this trip? Eventually, movement of the boat by pushpole became very difficult. Pushing with all our strength would hardly advance the craft even three feet. "Well, now," said Mr. Tom, " one of us needs to wade in the water, grasp the bow and pull at the same time I'm pushing. When we get to deeper water, you can get back into the boat." Not wishing to appear cowardly, I relayed to Mr. Tom Chesser. "I'll do it." Exiting the tiny boat and nearly capsizing it, I first found myself in water reaching to my kneecaps. By my grasping the bow, wading beside the boat, and pulling, we soon found our way into water deep enough for use of pushpoles. Stepping into a deep hole, I could not touch the bottom. At that very instant, a large cottonmouth skidded across the water towards my my head; wiggling its tail angrily and staring into my face as if to tell me, "Get out of this place here. My nest and eggs are close!" It was kind of that snake not to bite me. Its appearance caused me to attempt a rapid re-entry into the middle seat of the pushboat. I came very near overturning it. Fortunately, the water there was of sufficient depth that Mr. Tom and I could use pushpoles for moving through Chase Prairie. Pushpoling for a distance of two miles requires an excess of energy, and good physical conditioning is a must. Mr. Tom sited our fishing hole- a 'gator-made lake of less than one-half acre. Pausing in relief and cupping our hands into reservoirs, we quenched our thirst and wet our sweaty faces. The swamp water was safe for drinking. Gene Siepert, the refuge biologist, had performed tests that led to conclusions that there were no dangerous bacteria in the waters of "The Great Okefenokee Swamp." Happy to have reached our destination, we were in a position to fish. Rigging our cane-poles; each with six inches of black line, one-half inch fish-hook, and small split-shot weights, we baited our hooks with crawfish. Our success was almost instant and continuous until we were frightened away. Our party had entered into a fisherman's dream- a catch every time the line is placed in the water. Those warmouth perch attacked our hooks savagely and ran speedily in a display of greed. We were all kept busy stringing fish and re-baiting our hooks. The warmouth perch, averaging one-quarter-pound weight, were to be the main course of our lunch on Sunday at the homestead of Mr. Tom Chesser and his wife, Iva. Our angling success never ended during that fishing trip. The air was putrid and sweltering, but not one of us suffered from fatique. Returning to Roddenberry's landing, fifteen miles away, was not nearly as difficult. Checking the time with my five-dollar pocket watch, it was soon half past noon. We were hungry, and it was time for the four of us to break into the lunch sacks prepared for us by Mr. Tom's wife, Iva. Feasting on southern-fried chicken, homemade biscuits, pimento cheese sandwiches and sweet-potato pie, we were sated and rested. We ended our lunch with generous pieces of Mrs. Iva Chesser's homemade rum-cake. Those vitals sure were tasty. There was also sweetened iced tea spiced up with lemon juice; and swamp water to cure our thirst and cool our faces. That's one of the best medicines during a sultry day in South Georgia. Following our lunches, we fished until near 1:30 P.M. Pleased to have harvested and strung seventy-eight warmouth perch and ten handsome bluegill, that was not quite our limit. We were short by just twenty-two fish. Perhaps nature was summoned to put a stop to our non-sensible visit. A sudden and severe storm sneaked its way upon us from the Southwest. It had approached us from the other side of Floyd's Island; hidden until it was falling right on top of us. By paddling our tiny boat fifty yards to Floyd's Island, from the pushboat we snuggled under a shelter made by turning our watercraft upside down among some small, pine-saplings. It was a thing that kept us safe and dry. That storm was of the first hints that it might be better to head homeward and end our day of adventure. Another consideration came to bare soon after we resumed fishing. Huey had a problem. Laying down his cane pole, he began to look around. Four huge alligators had gathered near our pushboat, and Huey began to feel that we were at risk. Huey was the one who brought the presence of those "gators" to our attention.Four sets of continuous bubbling-up gave were sure evidence that we had unwelcome company. "Daddy," he exclaimed excitedly, "Look! There's two alligator submerged not far from the bow and another two on the stern. I don't like the way this looks. Those are large "gators." I think we ought to get out of here in a hurry! I don't want to be food for 'gators. There's one on each side of us." Hesitating briefly, it was not long before I heard Mr. Tom say, "Mr. Rummy, I think we might ought to start making our way back now. Let's leave early enough that we'll have time to paddle back most of the way to the boatlanding if the motor breaks down or we can't find the boat we left on the trail. We need to get back before darkness. The mosquitos would devour us alive. Heading back towards the alligator trail, we were in for a surprise. As we were pushpoling, dragging, and paddling our back towards the main alligator trail and the boat we had abandoned, we ran right-into Johnny Eadie Junior, his brother Douglas Eadie, and Jo Lester Chesser- another of Mr. Tom Chesser's sons. Those three had taken a canoe and paddled it at least twelve miles toward where they thought we would be. "What are you three doing here?" asked Mr. Tom. Jo Lester answered, "We were worried about you. I couldn't help it, Daddy. This is a long way, and we thought you might run into problems. We came here to rescue you if you had trouble. "You took a chance in that canoe," said Mr. Tom. "That was the worst thing for you to do was come looking for us in that. A canoe is not safe for use in the swamp. You got soaking wet, didn't you? Now we have to worry about you three on our way back to the boatdock." "I'm sorry, Daddy. We just didn't want to take any chances on you." Upon locating the larger boat on trail, Mr. Tom, Huey, and George and I made a rapid and "not-as-difficult" return to Roddenberry's boatlanding. Although fatigued, we were in good physical and mental condition- making rapid recovery. A bounty of fish and a unique experience were in our possession. We had visited and fished in a remote area inaccessible to most people. That fishing trip to Chase Prairie in the Great Okefenokee Swamp was an unforgettable adventure during the lives and times of Rummage Ira Fulks and his young son, George. The fishing and adventure itself was a sideline for reason that Mr. Tom had many wonderful stories to tell on the subject of his life and ownership of an island on the edge of "the Great Okefenokee Swamp" He related those tales to us in a most wonderful way. Considering the remoteness of Chase Prairie and Floyd's Island and the energy required to reach it, my son and I chose therafter to stay more close to the boatlanding. George and I never tried to go Chase Prairie or Floyd's Island again. It's just too difficult that way. That one adventure was an experience of a lifetime. The Chessers were attached to their homestead to an extent that they traveled to the markets in Folkston and surrounding counties only when necessary. They were independent and subsisted in very much the same manner as had my relatives in Kentucky. 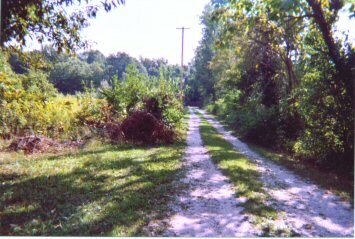 Their farming techniques were the same primitive methods used by my ancestors in Kentucky-one man or child behind a horse or mule plowing a single row for row after row; into the sun, the sun overhead, or shining on ones back. There was a wooden harrow with a single shovel. The work was hard for my brothers and me, and I'm sure it was every bit as difficult for the Chessers. The Chessers were an extraordinary team as a family and workforce. Most of the time, it had been that way for my farmer ancestors. If one doesn.t he'd be sorry. The same rules applied as for my brothers and me. Laziness was not tolerated and would result in a whipping by use of a razor strap,and that made primitive farming methods a hard way to go. Attesting to our safe return from Chase Prairie to our house at Camp Cornelia and the Chesser Island Homestead is my account of that day long ago. A most festive occasion ends our story. We were together on the day following The Journey To Chase Prairie, we four adventurers and fishermen shared a homecooked meal appropriate for royalty. My wife, Ella Belle Fulks, was also in company of the Chessers. That savory meal was prepared by Iva Chesser. (most surely one of the best cooks in the world) Feasting on fish and hushpuppies, sweetpotato pie,fresh garden vegetables, and sugar-cane syrup, our feast was crowned with ice-cold tea and lemon slices. The home of the Chessers remains intact; much as during 1952. Iva and Mr. Thomas Chesser have deceased, and many others sharing those times and places are gone. Their words, behaviors, and faces remain surreal for me. If my son recollects our adventure, I do not know. Stored within the recesses of my memory, the images and their impact upon the lives of "The Rummage Ira Fulks family" are perpetual. Created and recorded herein was a superb piece of photography; as real today as it was then.1952 Ending here is a story that only the four of us who experienced The Journey To Chase Prairie could tell. It's one that won't be forgotten. SECOND EDITION COMPLETED: Rummage Ira Fulks> 6-8-2008> 12:15P.M.